The president of Nintendo of America wasn't counting girls playing DS, moms playing PCs or sisters dabbling with the family's Wii when he announced that there are more than 11 million females in the Americas who play consoles. 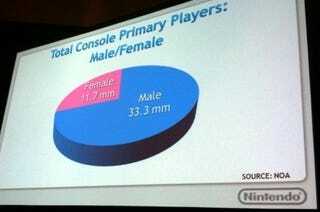 At a BMO Capital Markets event for game companies and investors earlier this month, Reggie Fils-Aime presented two slides that, based on Nintendo of America research, put the population of female "primary players" of home consoles at roughly a third of the population of their male counterparts. These "primary players" are the main users of consoles in their homes, he explained. Of course, Fils-Aime brought this up in order to demonstrate how much of that market is dominated by female Nintendo console-owners: 80% or, roughly, nine million. "This didn't happen by accident," he said during his presentation. "It's the result of a deliberate attempt to expand the market."